It wasn’t pretty, but Seward County Head Coach Toby Wynn knew it wouldn’t be Saturday night as the #4 Seward County Lady Saints hooked up with the Butler Grizzlies in a big Jayhawk Conference contest for both sides. However, in the end, the only thing that mattered, the scoreboard, was in the Lady Saints favor at 50-46 at the final horn as Seward shook off a brutally cold start to down the Grizzlies and move to 18-1 on the year. Things didn’t get off to a great start for the Lady Saints Saturday as Butler got a pair of early threes to take an early 6-0 lead. Seward didn’t get on the board until the 3:30 mark, but would use the momentum from the Mollie Mounsey three to go on an 8-0 run to take an 8-6 lead on the Grizzlies. Butler went 4:44 without a point through the middle portion of the quarter , but the Lady Saints weren’t able to push their lead past two and a free throw from the Grizzlies broke their drought and made it a one point game at 8-7. A pair of late buckets from Neidy Ocuane and another from Erin Richardson gave Seward a 15-9 lead and momentum though into the break at the end of one. The second quarter was a forgettable one for the Lady Saints. The first points of the quarter from either side, came from Butler 2:08 in and the Grizzlies picked up another bucket a minute later and one near the midway point of the quarter to tie the game at 15. The ice cold Lady Saints couldn’t get anything to fall on their side of the floor as Butler dropped another two in with 1:54 to go in the half and got a three from Ciara Johansen to make it a 20-15 game in favor of the Grizzlies with just one minute to go in the period. 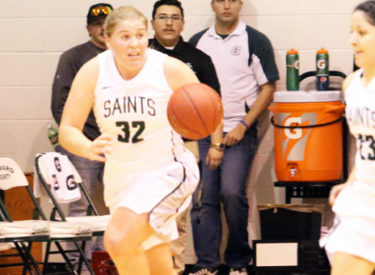 Seward did not score a single point until Mounsey willed a bucket home with 33 seconds to go in the half and it accounted for the Lady Saints entire offensive production for the quarter as they went to the half down by three 20-17. The Lady Saints went just 1-12 from the field in the second quarter, finishing the half shooting just 22% from the floor. Seward was also 0-7 from the three point line in the second to finish the half at 2-17. Seward’s offensive struggles didn’t disappear as the second half began as it took them four minutes to get on the board with a free throw from Joanna Grymek and nearly seven minutes before they would get their first field goal of the half. However, the Lady Saints defense was locked in on the other side, holding Butler to just three points of their own in the first 7:41 of the third quarter to keep the score close at 23-20 in favor of the Grizzlies. A pair of Seward free throws made it a one point game but a three from Butler answered and pushed their lead back to four. But the Lady Saints kept grinding, scoring seven of the next nine points in the contests and got a three from Brennyn Seagler to give them the lead back 29-28 with 48 seconds remaining in the quarter. Butler got the final points of the quarter to retake the lead but after a 17 minute stretch with only 3 points to close the second and begin the third, the Lady Saints trailed by just one after three 30-29. Butler sank a pair of free throws early in the fourth and Seward was again scoreless offensively for the first 2:30 as the Grizzlies held a three point lead. Richardson changed that as she buried a triple from the wing to tie the score at 32 and Neidy Ocuane knocked down a couple of free throws to put the Lady Saints up two 34-32. After another Butler free throw, Mounsey decided it was time to turn the afterburners on. Before her three with 5:00 left in the contest, Mounsey was just 1-10 from the three point line on the night, but in a 1:45 stretch, Mounsey knocked down not one, not two, but three huge three pointers, in a flash giving Seward their largest lead of the night at 43-35 with 3:05 to go. Playing with a multi-possession lead for the first time in the second half, the Lady Saints panicked and an opportunistic Butler group took advantage, going on a 6-0 run to cut the Seward lead back to just two at 43-41. A Mounsey to Seagler hook up broke the Grizzly run, but Butler answered right back to make it a one point game once more at 45-43 with 1:23 to go. The Lady Saints went empty on their next trip down the floor and Butler hit a pair of free throws to knot the score at 45 with under a minute to go. Both teams failed to put the ball in the basket in their next possessions, but Ocuane found a hole in the left side of the Butler defense and bolted to the basket for two to give the Lady Saints the lead back with 37 seconds left. Seward forced a turnover the next time down the floor, but gave it right back to Butler on a trap on an inbounds with 24 seconds remaining. Butler had a chance to tie the game at the line with 11 seconds remaining, but made just one of two to keep Seward in front. With 10 seconds left, Mounsey hit one of two from the line to put the Lady Saints up by two and Butler raced the ball up the court on the ensuing possession, but inexplicably threw the ball out of bounds in front of the Grizzly bench with five seconds remaining. The Lady Saints had a chance to ice the game as they went to the line on an intentional foul call, but missed both freebies to keep it a 48-46 game. However, it was Mounsey to the rescue as she was fouled and got two free throws and stepped up and buried them with ice in her veins, putting the finishing touches on a 50-46 win for the Lady Saints to send them to 18-1 on the year. The final stat sheet was not pretty for either side as the Lady Saints shot a season low 31% on the night and were just 7 of 30 from three point land, but still outshot Butler who made just 29% of their attempts on the night. Mounsey led all scorers with 19 while Ocuane finished with 13 and Grymek scored just six, but grabbed a game high 11 rebounds and blocked four Butler shots. The Lady Saints move to 18-1 on the year with the win and keep pace with Hutchinson atop the conference standings at 14-1. Butler falls to 12-5 and 9-5 in league play. Seward’s tough stretch continues on Wednesday when they make the trip to Northeast Kansas to take on the Cloud County Thunderbirds. Seward and Cloud will tip things off at 6:00 at Bryant Gymnasium in Concordia.